Speaking of Research congratulates John O’Keefe, May-Britt Moser and Edvard I. Moser on being awarded the 2014 Nobel Prize in Physiology or Medicine “for their discoveries of cells that constitute a positioning system in the brain”. By recording the activity of individual nerve cells within the brains of rats that were moving freely through their environment, they have shown how specialised nerve cells work together to execute higher cognitive processes. In 1971 John O’Keefe identified the first component of the system, by identifying cells in the hippocampus that were only activated when a rat was in a certain position in its environment. These cells were activated when the rat visited the same location, but different nerve cells were activated when the rat visited a new location, these “place cells” were not merely registering visual input, but were building up an inner map of the environment. John O’Keefe is now a professor at University College London, where he studies the neural basis of cognition and memory in humans and animals. In 2005 May-Britt Moser and Edvard I. Moser identified a second part of the system, a group of nerve cells in the an area of the brain adjacent to the hippocampus named the entorhinal cortex which were activated when a rat passed multiple locations arranged in a hexagonal grid. Each of these “grid cells” was activated in a unique spatial pattern and together they allow the rat form mental representation of a coordinate system that allows the rat to navigate through space. 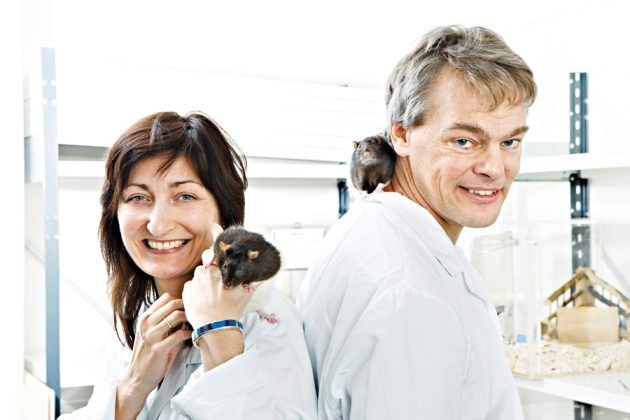 If you would like to learn more about their work at the Norwegian University of Science and Technology in Trondheim, Alison Abbott has written an excellent article in Nature News on the studies that led to the discovery of grid cells and their ongoing research in this field. These place and grid cells have since been found to be present in all mammals, including humans, and equivalents are present in other vertebrates. In humans, the hippocampus and entorhinal cortex are frequently affected in the early stages of Alzheimer’s Disease, and it is hoped that understanding how the positioning system discovered by this year’s Nobel laureates in Physiology or Medicine will help us to understand the mechanism underpinning the loss of spatial memory that often leaves patients unable to recognize and navigate through familiar environments. This year’s Nobel Prize highlights once again the continuing importance of animal research in pushing the frontiers of Neuroscience, and in particular the critical importance of techniques that use implanted electrodes to record the activities of individual nerve cells. In an interview following the Nobel Prize announcement John O’Keefe stressed the continuing importance of animal research and warned of the danger to science from excessively strict animal research regulations. The Nobel Prize is of course not the only award that recognizes excellence in scientific and medical research, and since the 1940’s the Lasker Foundation has granted awards to recognize excellence in basic and clinical medical research. In 2014 the Foundation has awarded its Lasker-DeBakey Clinical Medical Research Award to Alim Louis Benabid and Mahlon R. DeLong for “the development of deep brain stimulation of the subthalamic nucleus, a surgical technique that reduces tremors and restores motor function in patients with advanced Parkinson’s disease.”. The development of deep brain stimulation of the subthalamic nucleus is a classic example of the intellectual cross fertilization between laboratory and clinical research that drives medicine forward, as Dario Ringach described on this blog a couple of years ago in “A Brief History of Deep Brain Stimulation”. In the award description the Lasker Foundation again highlights the synergy between animal and clinical research. First it looks at how Mahlon DeLong recognized the significance of the accidental discovery that a chemical called MPTP could induce Parkinson’s disease like symptoms, a discovery that would allow him to resolve long-standing questions concerning the role of different regions of a part of the brain known as the basel ganglia in Parkinson’s disease. DeLong seized upon the opportunity. A part of the basal ganglia called the subthalamic nucleus drives the inhibitory output signal, and in 1987, DeLong reported that MPTP triggers neurons in the subthalamic nucleus of monkeys to fire excessively. Perhaps, DeLong reasoned, the overexuberant signals quash motor activity in PD. If so, inactivating the subthalamic nucleus might ameliorate some of the illness’s worst symptoms. On the other side of the Atlantic in Grenoble, Alim-Louis Benabid realized that DeLong’s findings could used to greatly improve a new therapy for Parkinson’s disease that he had pioneered. Although the technique quelled tremors, Benabid knew that this symptom was not the one that most debilitated people with PD. Perhaps high-frequency stimulation of brain areas other than the thalamus (i.e., the subthalamic nucleus) would alleviate the more troublesome aspects of the illness such as slowness of movement and rigidity, he reasoned. In this state of mind, Benabid read DeLong’s report that damage to the subthalamic nucleus wipes out multiple symptoms of PD in animals. This site was not an attractive target: Lesioning procedures and spontaneous lesions had established decades earlier that, when things went wrong, violent flailing could result. By that time, however, Benabid had performed high-frequency stimulation of the thalamus and other brain regions’ in more than 150 patients. He was confident that he would cause no harm in the subthalamic nucleus; if necessary, he could remove the electrode. While DBS of the subthalamic nucleus is not a cure for Parkinson’s disease, it can relieve many of the major symptoms, and has benefited tens of thousands of patients around the world whose symptoms are not adequately controlled by first-line therapies. Currently DBS is also being explored as a therapy for several other neurological conditions, including depression and chronic pain. What would you think if you read that scientists had received tens of thousands of taxpayer dollars to massage newborn rat pups? You might think that it is exactly the sort of research that opponents of basic science like to parade as examples when accusing the NIH of wastefulness. However, as usual the truth turns out to be quite different. In September the 18th Saul Schanberg, Tiffany Martini Field, Cynthia Kuhn and Gary Evoniuk , were among the 8 recipients of the Golden Goose Award at a ceremony at the Library of Congress in Washington, D.C., an award established “to demonstrate the human and economic benefits of federally funded research by highlighting examples of seemingly obscure studies that have led to major breakthroughs and resulted in significant societal impact”. A series of experiments ruled out factors such as nutrition, body temperature and maternal pheromones. The researchers then made the key observation: the rat mothers spent a great deal of time grooming and vigorously licking their pups. Wondering whether the act of stimulation through licking was making the difference, the researchers simulated the mother’s tongue with a small brush and stroked up and down the rats’ tiny backbone. This was the missing link. Enzyme and growth hormone levels rose and the rat pups thrived again. Since their discovery tactile stimulation of preterm babies, in the form of infant massage, has become standard practice in many neonatal intensive care units around the world. It has been demonstrated to greatly improve the outcome for babies born prematurely millions of lives around the world, and saved billions of dollars in healthcare costs in the United States alone. It’s yet another example of how “Off the wall” scientific research can deliver the goods! Spending on basic scientific research is a crucial long-term investment, one whose precise outcomes are never certain, but which will pay off in both advancing knowledge and improving our future health, well-being and prosperity! Posted on October 6, 2014 October 7, 2014 by EditorPosted in News, Science NewsTagged Deep Brain Stimulation, Golden Goose Awards, grid cells, Lasker Foundation, nobel prize, preterm babies. What animal rights extremists call “curiosity-based science” with no relevance to humans and “torture”, the Nobel committee calls paradigm shifting basic science that has changed our very understanding of the brain itself. Once again, the Nobel Comittee has recognized responsible and humane basic and translational animal research that is fundamentally necessary for the evolution of our comprehension of how the brain supports our mental functions and how its dysfunction contributes to mental illness and neurologial diseases.